Protein Datasets: These protein datasets are maintained by Shuiwang Ji, CS Department, Louisiana State University/USA. "Introduction to Data Mining (2nd Edition)". By Pang-Ning Tan, Michael Steinbach, Anuj Karpatne, and Vipin Kumar. Pearson. 2019. ISBN-13: 978-0133128901 ISBN-10: 0133128903. See the book's link above for book slides and other resources. "MIT Researchers Develop AI Bias Reduction Method"
Prof. Roberto V. Zicari's slides. Internet Live Stats Excellent illustration about the rate at which data is being generated. Fayyad, U., Piatetsky-Shapiro, G., and Smyth, P. "From Data Mining to Knowledge Discovery in Databases". AAAI Magazine, pp. 37-54. Fall 1996. Tan's, Steinbach's, and Kumar's textbook slides - Chapter 1. Witten's and Frank's textbook slides - Chapter 1. Data Mining in Bioinformatics Series: Advanced Information and Knowledge Processing by Wang, J.T.L. ; Zaki, M.J.; Toivonen, H.; Shasha, D.E. (Eds.) 1st Edition., 2005, XI, Springer. Weka's source code: available in a file called "weka-src.jar", located in the directory where Weka was installed. You need to unzip and/or use jar utilities on this file to extract its contents. Inside, you will find the .java files that implement Weka. Consult the "README" file, the "documentation" webpage, and the "WekaManual.pdf" provided with the Weka system (in the same directory where Weka was downloaded). Browse through the "Package Documentation" to become familiar with it. There are several YouTube videos with information about Weka - some of them from one of the Weka creators (Ian Witten). Witten's and Frank's textbook slides - Chapter 2. The main objective of this lecture is to become familiar with the Weka system. Get familiar with the sample datasets provided with the Weka system. An OPTIONAL header with general information about the dataset. Each line in this header starts with "%" to denote that these are commented lines. These attributes are the "column names" of the tabular data that comes after. Run the Weka system. Choose the "Explorer" option in the main window. Load the contact lenses dataset into the Weka System using "Open File". Go back to the "Preprocess" tab and modify the input dataset using the following preprocessing filters. Access the filters by clicking on the "Choose" button. Remove This filter removes one or more attributes from the current dataset. Use say "1-2" in the "AttributeIndices"
Resample This filter selects a random sample from the data instances in the current dataset. Use say "20.0" in the "SampleSizePercent" to select a subsample of 20% of the current instances. If time permits, discuss how to convert a dataset to ARFF (attribute relation file format). Prof. Ruiz's miscellaneous notes about Matlab. Including ways to input data onto Matlab. Prof. Ruiz's miscellaneous notes about R. Including ways to input data onto R.
Prof. Ruiz's miscellaneous notes about Python. Including ways to input data onto Python. Han's Chapter 2 - Data Warehousing. Slides 13-18, 24-30, 58. Tan's, Steinbach's, and Kumar's textbook slides - Chapter 3. Slides 31-41. See some preprocessing filters in Weka. Tan's, Steinbach's, and Kumar's textbook slides - Chapter 2. Witten's and Frank's textbook slides - Chapter 3. Witten's and Frank's textbook slides - Chapter 7.
includes attribute discretization, sampling, dimensionality reduction, attribute selection, CFS, PCA/SVD, text to attribute vectors. M.W. Berry, Z. Drmac, and E.R. Jessup, "Matrices, Vector Spaces, and Information Retrieval", SIAM Review, Vol.41, No.2, pp.335-362, 1999. Wall, Michael E., Andreas Rechtsteiner, Luis M. Rocha. "Singular value decomposition and principal component analysis". in A Practical Approach to Microarray Data Analysis. D.P. Berrar, W. Dubitzky, M. Granzow, eds. pp. 91-109, Kluwer: Norwell, MA (2003). LANL LA-UR-02-4001. Tan's, Steinbach's, and Kumar's textbook slides - Chapter 3. Section 3.3. Multidimensional Scaling (MDS). Tan's, Steinbach's, and Kumar's textbook. Appendix B.2.3. Tan's, Steinbach's, and Kumar's textbook slides - Chapter 4. Slides 74-93. Witten's and Frank's textbook slides - Chapter 5. Slides 2-8, 15-20. Ruiz's example using diabetes.arff - useful spreadsheet with confidence interval calculations. Tan's, Steinbach's, and Kumar's textbook slides - Chapter 5. Witten's and Frank's textbook slides - Chapter 8. Prof. Ruiz's Decision Trees Slides. Class Handout: From ID3 to J4.8. Tan's, Steinbach's, and Kumar's textbook slides - Chapter 4. Slides 1-30, 38-41, 46-55, 57-73. Witten's and Frank's textbook slides - Chapter 4. Slides 28-46. Witten's and Frank's textbook slides - Chapter 6. Slides 5-11, 13-19, 23-24.
includes: handling continuous attributes, missing values, pre-pruning and post-pruning. CS4445 B12 Decision Trees Homework 2 solutions by Ken Loomis. Includes: decision tree construction, handling missing values during classification. CS4445 B06 Decision Trees Homework 1 solutions by Piotr Mardziel over the a subset of the cars dataset adapted from the Car Evaluation Dataset available at the The University of California Irvine (UCI) Machine Learning Data Repository. 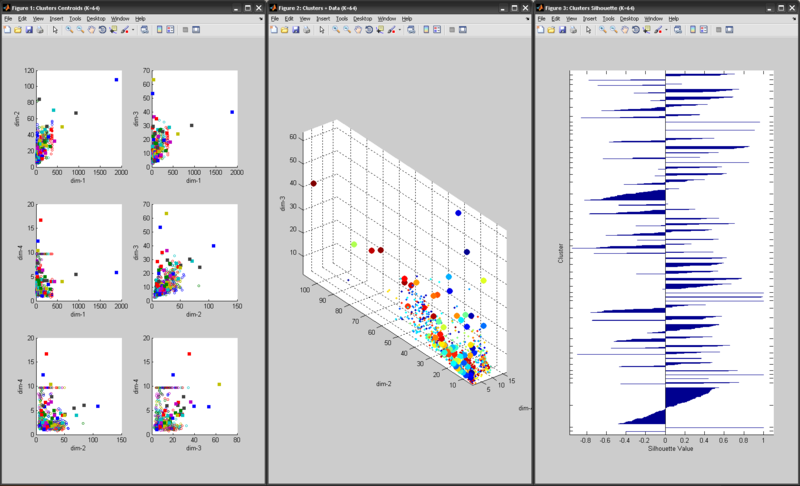 Tom Fawcett's Machine Learning Classifier Gallery. Mike Calder's showcase slides on Decision Trees for Stock Market Forecasting. ** See an algorithm for constructing decision trees, and the modifications needed to obtain an algorithm for construcing regression and model trees in: CS548 Spring 2015 Quiz 4 Solutions. Witten's and Frank's textbook slides - Chapter 3. Slides 5-15. Witten's and Frank's textbook slides - Chapter 4. Slides 74-75. ** Witten's and Frank's textbook slides - Chapter 6. Slides 95-100, 102-104, 107-111. ** Witten's and Frank's textbook slides - Chapter 5. Evaluating Numeric Predictions. Slides 56-60. ** Linear Regression. Tan's, Steinbach's, and Kumar's textbook. Appendix D online. ** Mitchell's Chapter 4 slides. Yann LeCun, Yoshua Bengio, Geoffrey Hinton. "Deep learning". Nature 521, 436-444 (28 May 2015) doi:10.1038/nature14539. ** Deep Learning - The Past, Present and Future of Artificial Intelligence" by Lukas Masuch. ** an introduction to: Deep Learning by Prof. David Wolfe Corne. ** Google's ML Practicum: Image Classification Introducing Convolutional Neural Networks. Tutorial from Y. Bengio's LISA lab in Montreal. "Recent developments on Deep Learning" Geoffrey Hinton's GoogleTech Talk, March 2010. ** Kevin Murphy's Machine Learning Textbook. Figures Chapter 28. Witten's and Frank's textbook slides - Chapter 4. Slides 47-60. Witten's and Frank's textbook slides - Chapter 6. Slides 26-32. What if we run ackermann.arff using Prism? Tan's, Steinbach's, and Kumar's textbook slides - Chapter 5. Slides 49-60. Witten's and Frank's textbook slides - Chapter 4. Slides 90-92, 101-102. Witten's and Frank's textbook slides - Chapter 6. Slides 68-72. Expectation Maximization (EM): Slides 150-154. Tom Mitchell's textbook slides - Chapter 6. Expectation Maximization (EM): Slides 168-174. Mike Calder's showcase slides on Bayesian Models for Estimating Software Quality. G. F. Cooper & E. Herskovits. "A Bayesian Method for the Induction of Probabilistic Networks from Data". see Prof. Ruiz's K2 handout. over the toy dataset in that paper. Michell's book Chapter 9 slides. Russell's & Norvig's Figure - Genetic Algorithms. Asa Ben-Hur, Cheng Soon Ong, So�ren Sonnenburg, Bernhard Scho�lkopf, Gunnar Ra�tsch. "Support Vector Machines and Kernel for Computational Biology". PLOS Computational Biology. Vol 4. Issue 10. e1000173. Oct. 2008. Christopher D. Manning, Prabhakar Raghavan & Hinrich Sch�tze. "Introduction to Information Retrieval". Cambridge University Press. 2008. Lawrence R. Rabiner, "A Tutorial on Hidden Markov Models and Selected Applications in Speech Recognition," Proceedings of the IEEE, Vol.77, No.2, pp.257-286, Feb. 1989. Durbin, Eddy, Krogh, and Mitchison. "Biological Sequence Analysis". Cambridge University Press. 1998. Chapter 3. ** Ydo Wexler & Dan Geiger's Markov Chain Tutorial. ** Hidden Markov Models (HMMs) Tutorial. Prof. Moore's Hidden Markov Models Tutorial (Carnegie Mellon Univ.). Available also from Andrew Moore's Tutorials Webpage. Tan's, Steinbach's, and Kumar's textbook slides - Chapter 6. Slides 1-25, 45-65. Tan's, Steinbach's, and Kumar's textbook slides - Chapter 7. Slides 1-10, Sequential Data: Slides 26-45. Witten's and Frank's textbook slides - Chapter 4. Slides 61-73. ** Tan's, Steinbach's, Karpatne and Kumar's textbook slides (2nd edition) - Chapter 7 (slightly modified). These slides have been modified slightly to to include the version of the DBSCAN algorithm from the textbook. Label all points as core, border, or noise points. Put an edge between all core points that are within Eps of each other. Make each group of connected core points into a separate cluster. Assign each border point to one of the clusters of its associated core points. Witten's and Frank's textbook slides - Chapter 4. Slides 103-105. Witten's and Frank's textbook slides - Chapter 6. Slides 93-108. ** Evaluation of Clusterings from "Introduction to Information Retrieval By Christopher D. Manning, Prabhakar Raghavan & Hinrich Sch�tze"
Mike Calder's showcase slides on Clustering for Market Segmentation. Ruiz's notes on Anomaly Detection. Mike Calder's showcase slides on Anomaly Detection for Cyber Security. "Web Mining - Accomplishments & Future Directions." by Jaideep Srivastava, Prasanna Desikan, and.Vipin Kumar. Jaideep Srivastava's Web Mining Tutorial. ** Christopher D. Manning, Prabhakar Raghavan & Hinrich Sch�tze. "Introduction to Information Retrieval". Cambridge University Press. 2008. Use this online textbook as a reference. N. Evangelopoulos and L. Visinescu. "Text-Mining the Voice of the People". Communications of the ACM. Vol. 55, No. 2. pp. 62-69. February 2012. ** COMAD 2010 tutorial slides on IR and text mining in bioinformatics Part I and Part II. Rebholz-Schuhmann D., Oellrich A., Hoehndorf R. "Text-mining solutions for biomedical research: enabling integrative biology". Nature Reviews Genetics. 2012 Dec;13(12):829-39. doi: 10.1038/nrg3337. Epub 2012 Nov 14. My Bioinformatics and Computational Biology Resources and References. Sequential pattern mining based on frequency. Tan's, Steinbach's, and Kumar's textbook slides - Chapter 7. Slides 26-47.